Last week, Professor Pinsker, Leah Miller, and I joined the top students from our “Understanding Lincoln” online course (and about 5,000 other people) at Gettysburg National Cemetery to commemorate the sesquicentennial of Lincoln’s eponymous address there. We heard from Interior Secretary Sally Jewell, Senator Bob Casey, Governor Tom Corbett, and others. Almost every moment of the ceremony was beautiful, and viewable for posterity on CSPAN here. The most intriguing part of the event, however, was not even listed on the program. Justice Antonin Scalia made a surprise appearance to swear in more than a dozen new American citizens from countries in Europe, Africa, and Asia. 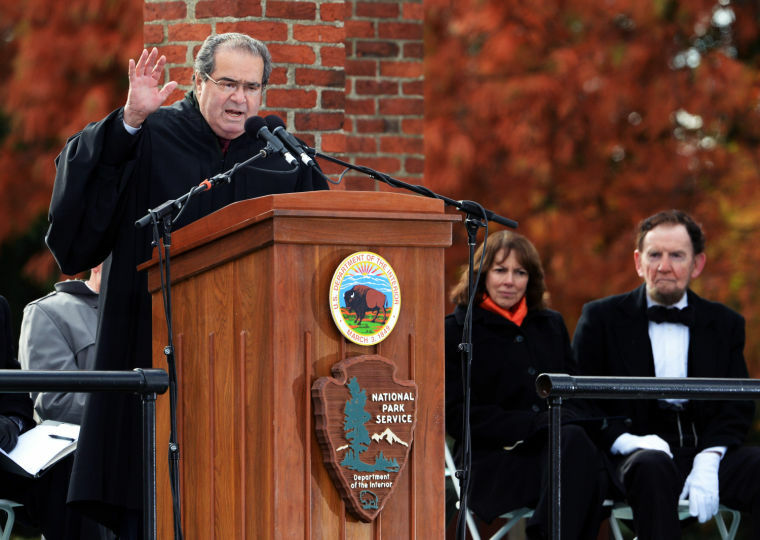 Before he presided over their recitation of the oath – a strange, but moving thing itself – Justice Scalia offered a few “words of welcome to the new citizens.” Most strikingly, he noted that the concept of being “un-American” is unique to the political culture and national identity of the United States, adding that “we used to have a House Un-American Activities Committee.” That someone would use HUAC as a positive example of something, as a statement about how Americans see themselves, was jarring to me. HUAC only helped define what was “un-American” by being un-American — by intimidating and investigating citizens who held minority views. Justice Scalia addresses the crowd gathered at Gettysburg National Cemetery as James Getty, a renowned Lincoln reenactor, looks on. If you watch the clip, as you can above, Justice Scalia’s reference to HUAC almost sounds like an aside; a brief meandering away from a well-hewn script. Even if we agree to treat it as such, his remarks are still problematic. Justice Scalia goes on to say that there is no concept, “in French political discourse,” of being “un-French,” no concept of being un-German in Germany, etc. He points to this fact as central to what others have labeled American exceptionalism. History does not support that claim, though. Six million Jewish people were murdered for being ‘un-German,’ and Muslims and African immigrants are routinely subjected to various indignities for being ‘un-French.’ The same concept that energized HUAC has festered in other countries for decades. It is not what makes the United States – or any country – great. What a supreme observation on a “supreme.” I was there and did not question the elder. What a fresh view from a youth weaved with optimist skepticism that teaches us that our own history is richer when view in a global context. Mr. Nelligan has great journeys ahead of him!! !